Dondra, a devoted mom, grandma, great-grandma, sister & friend, died peacefully at home on February 12th after a long, hard fought battle with cancer. She is survived by her children Crashena Vanhecke (Vincent), Monica Lopez, Rico Lopez (Tahra), Melina Lopez, Dara Mitchum (David), grandchildren Uriah Stowe (Eveline), Javier Lopez (Candice), Acacia Stowe, Tre & Alex Alvarado, Sonny Mitchum, Melissa Mitchum (Seth), great-grandchildren Gabriel Lopez and Vinny & Bella Rosales, sister Julie Bowden and numerous nephews & nieces. Dondra was predeceased by her dad, mom (February 4, 2017), brother Bill and husband Sy Lankin. Dondra was born on March 12th, 1942, in San Luis Obispo to CB & Jewel Bowden. She grew up mostly in Shell Beach, with some time spent in San Luis Obispo and Florida before settling in Santa Barbara. Once in Santa Barbara she met and married Richard Lopez and together they raised their 5 kids. She was fortunate to be able to stay home with her kids and be a loving homemaker while being the PTA President and working as a noon duty aide while her kids were young. After these years, her relationship with Richard ended and she then met and married Sy Lankin. 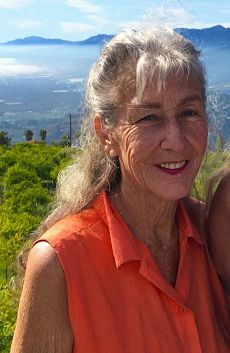 For many years, Dondra was a proud member of the First Baptist Church of Santa Barbara, the Old Spanish Days Fiesta organization, the Elks Lodge #613 & the Spirit of ’76 group, to just name a few. She volunteered wherever she could, be it ushering a play, serving wine at a festival, guiding a parade or helping at her favorite auctions. In addition, she traveled and danced her way throughout the world! Wherever she visited, Dondra found a dance or two! Dondra will forever be remembered for her wild, fun, outgoing personality and bright, colorful clothing! Her motto was “The brighter, the better!” In her words, she was “A doer” and indeed she was! We will be remembering Mom at a Celebration of Life luncheon on Saturday, March 18th at 11am, at Mulligans Café in Santa Barbara (3500 McCaw Avenue). Feel free to wear colorful attire, as Mom certainly would. The family would like to thank Dr. Greenwald from the Cancer Center of Santa Barbara for his wonderful care of Mom, as well as Janet Murphy from the Santa Barbara Visiting Nurse and Hospice Care. In lieu of flowers, please send donations to either of these wonderful services.